When building 3d models I’ve seen time and time again that topology can affect how a model bends, how it looks in certain lighting and even how well it can be morphed. When sculpting a poorly topologized base mesh in ZBrush, I have found myself fighting against the tendencies of the underlying shape. It wants to fold where I want it to expand. 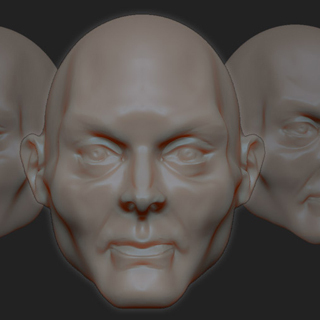 Triangles in the wrong spots can cause unsightly bumps when subdivided again making sculpting difficult. Experience has taught me that correcting bad topology can often take longer than simply building the right topology in the first place. Having a good base mesh increases artistic productivity by reducing the time it takes to build a figure completely from scratch. 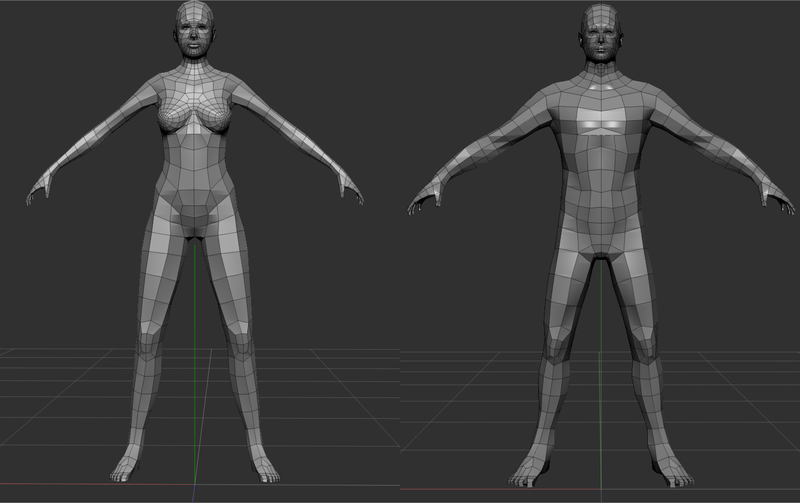 Creating your own base mesh also helps you to create more original figures for your portfolio. 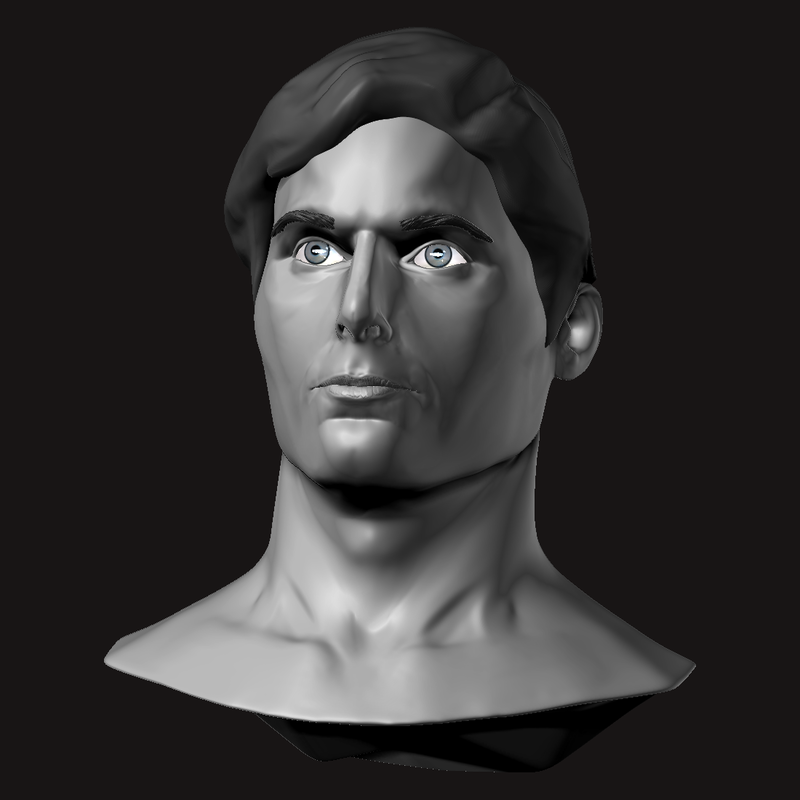 I generally create my base meshes in Silo and then sculpt then in ZBrush. Although these guidelines are based upon my workflow they could easily be applied to Blender, Maya or any other tool that allows for sculpting and edge loop creation. 1) Use quads over most of the figure. 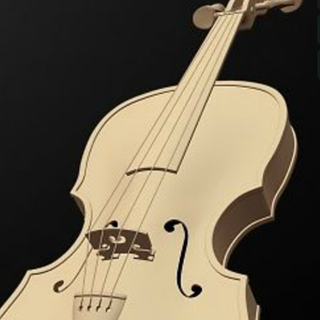 Programs like Blender, Silo and ZBrush give the artist the power to increase detail in a model through subdivision. As I’ve mentioned in previous posts, subdivision works best with quads (4 sided shapes). Some triangles in hidden areas (e.g. nostrils) are fine since they won’t be seen. As much as possible avoid using triangles. 2) For a base mesh, use the least number of quads possible. With subdivision, less is more. 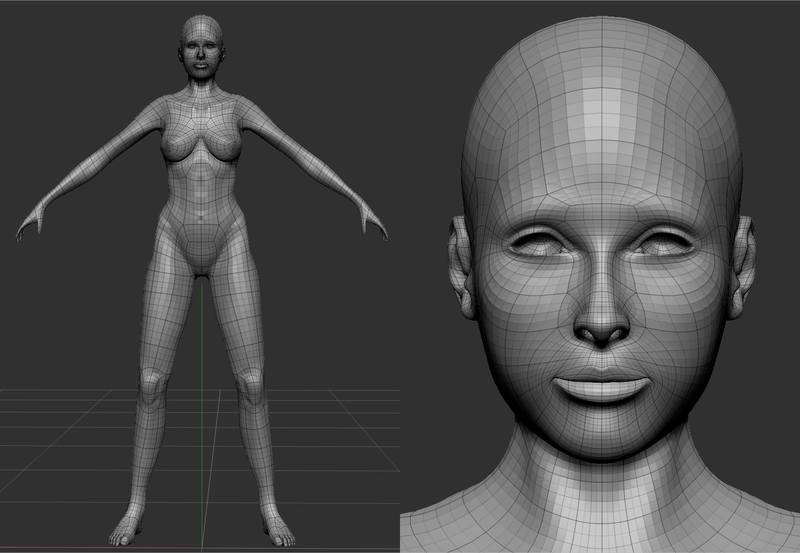 It is easy to put too much detail into a base mesh and end up with a figure that is too specific and not general enough to be molded into the desired character. Try to keep features vague so they can easily be manipulated later. With vague details you can make dramatic changes in your figure at a low subdivision level and project the results on a high level. Always try to reduce the number of quads you put into your base mesh. Try viewing your mesh with subdivision with some edge loops removed. If the effect is undesirable don’t forget CTRL-Z or CMD-Z. 3) Use larger quads on the body and smaller quads on the face. 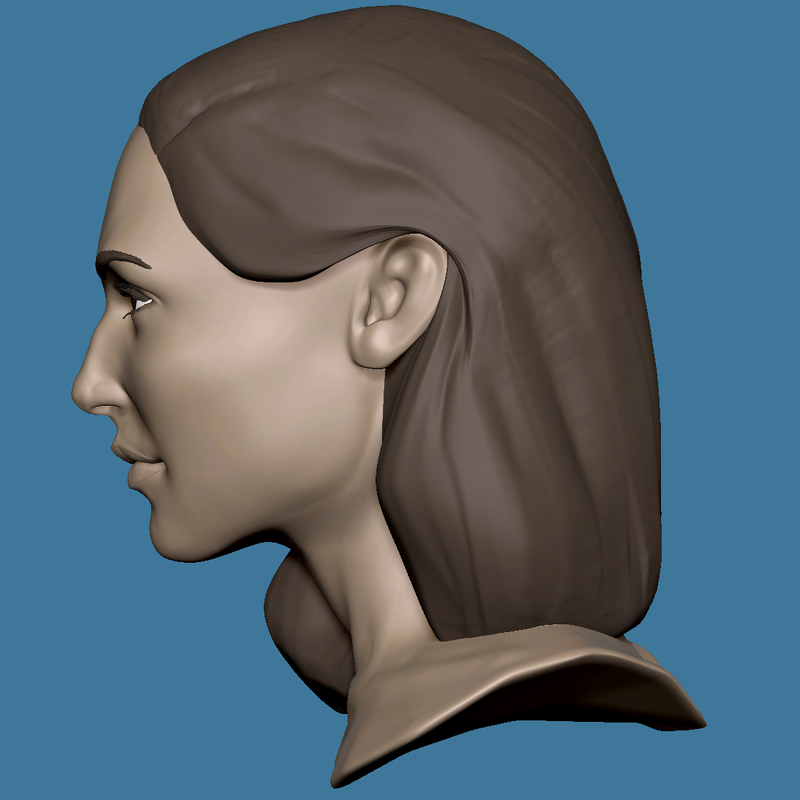 Generally, more detail is required for the face than the figure especially for complex features like the ears and the nose. Having more geometry to work with makes it easier to form the desired figure and reduces texture stretching when the figure is painted. 4) Mimic the underlying musculature and skeleton of the figure in the placement of quads. Placing quads to match important landmarks on the body (e.g. 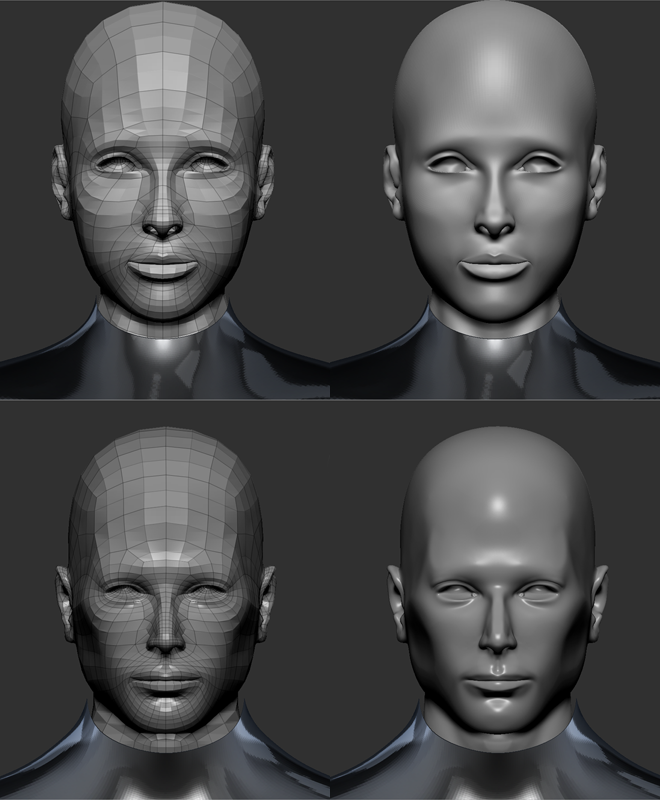 eyes, nose, lips, collar bones, hips) makes the sculpt easier. The base mesh reminds the sculptor “this is where to place a feature”. It also helps to maintain the form as it is sculpted. 5) Be prepared to star over. 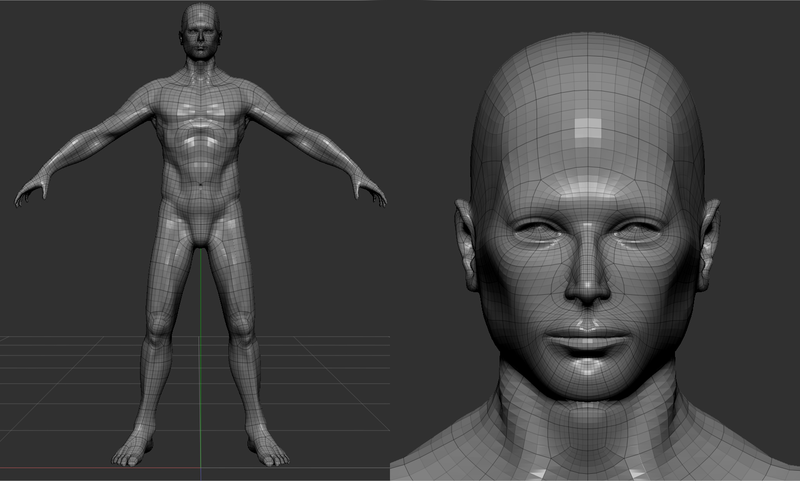 In writing this article, I created a base mesh I was reasonably happy with and found myself becoming unhappy as I sculpted on it. I had to go back to the drawing board and change some edge loops. 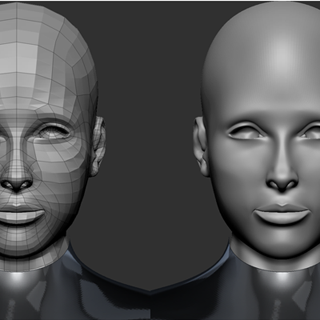 The newer mesh sculpted better but this is an iterative process. I will update the mesh as my skill level increases. Improvement always requires refinement. Next article Blender with BSurfaces: My Dream 3D app come true?